The new year has begun, a good time to look back to 2018. Last year we were able to build two high rope courses in China. The first one was assembled in Shanghai in the summer. The KristallTurm® 13-pole stands in front of a spectacular scenery right at the cruise ship terminal of the city. 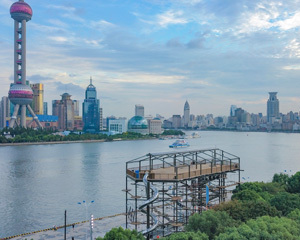 The second, a KristallTurm® 18-pole, was assembled in Ningbo, where it is operated as attraction for a hotel. 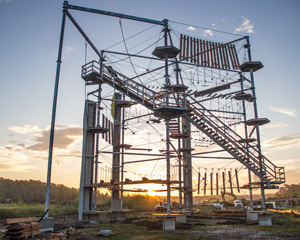 We also built a new KristallTurm® 7-pole in USA at Nona Adventure Park in Orlando, Florida. There is also a new KristallTurm® high rope course in Japan. In the Japanese prefecture of Shiga our team set up a KristallTurm® 12-pole at the end of the year. In addition to the high rope courses, we have also realized many great and varied playground projects in the last year. 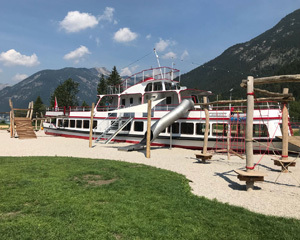 For example, in Krün, Upper Bavaria, there is a large ball track, in Maurach on lake Achensee in Austria there is a play ship with exciting play elements around it and the Lebenshilfe kindergarten in Bad Tölz received a varied playground with slides, swings and a climbing frame. In addition, during the year we built some fitness trails, for example in Slovenia, as well as bouldering walls and boulder cubes. In April we received the “Prize of the German Foreign Trade” for our worldwide projects. Furthermore we presented our new image film in November. Now we look forward to the new year and the upcoming jobs.